Some customers gave feedback about the different packages for the same model product. Indeed, a product has more than one type of packaging, which occasionally cause customers question the authenticity of their products. We apologize for that inconvenience and would like to publicly express the little differences to avoid future confusion. Here, we give a brief explanation about our modification on Tronsmart Element T6 Speaker. The silk text mark on the one side of the T6 speaker has been changed to the beneath of the speaker on the other side. The icon before Tronsmart logo on the bottom has been removed. Both kinds of T6 speakers are genuine products directly manufactured from Tronsmart factories and are 100% authentic. 2. About the color of the cables inside the package. We have changed the white accessory cables to black. And make the size of the user manual bigger than before. 3.About the purple color & white color package box. 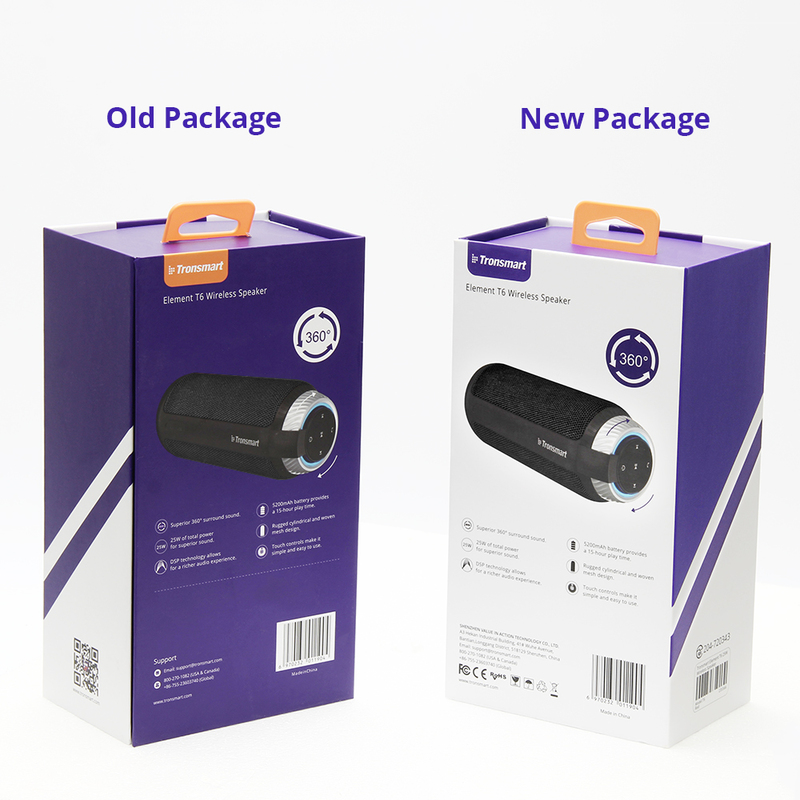 The first batch of T6 speakers was in purple color package box, later we changed the purple into white color. 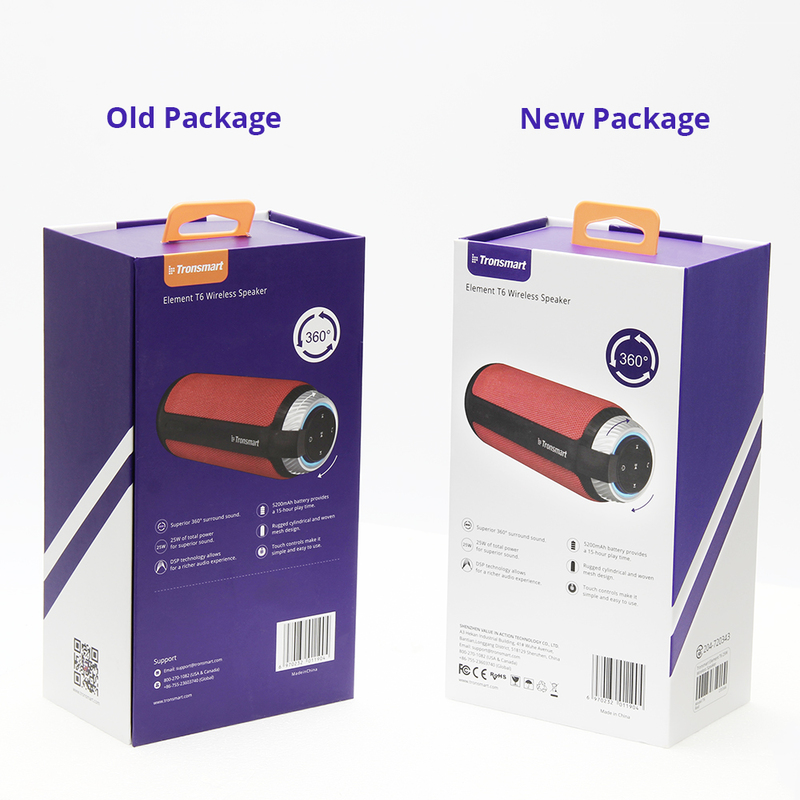 Now, most of the package boxes of T6 speakers are in white, only the previous ones were in purple. As technology develops, we will continue to update our products, some of the product packaging, and some of the cable colors will potentially be changed. We will inform the community regarding any relevant changes on this page and if you still have the question about our products, feel free to write to support@tronsmart.com.